NAHJDC met with several government public information officers–from the Department of Health and Human Services, the Minority Business Development Agency, the Federal Emergency Management Agency and the Department of Education –at our meet and greet round table last week. 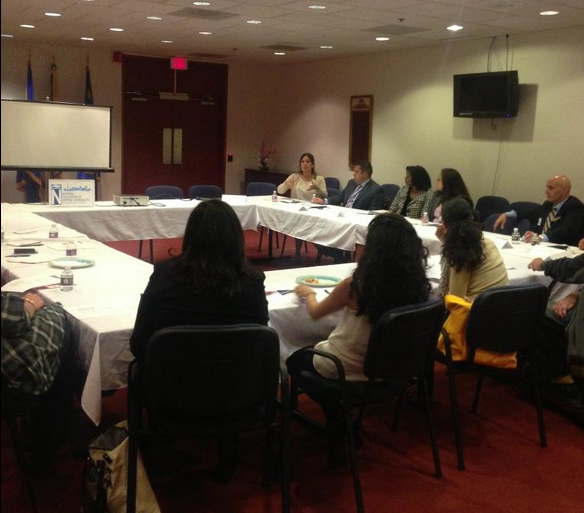 Thank you to all the members who attended and Gloria Sánchez-Contreras for hosting us at the HHS building! – Emails are typically the best form of communications. Phone calls are the second best option. Many of the PIOS consider text messages to be too informal. -When writing your email to a PIO, make sure you include as much detail as possible–including your deadline and even your questions. The PIOs explained that they need to get approval of the questions being asked before they can answer. By including questions in your initial email, you will save time and guarantee a quicker response. – Consider that the PIOs need to go through several channels within their department (consulting the specific program you are inquiring about, and also lawyers) before they get your response. The PIOs agreed that this is why it takes longer to respond to certain requests. -If you’d like to be ahead of the curve in getting information from a specific government department, the best thing to do is sign up for the press list (some PIOs said the information hits those lists before anywhere else). You can also contact the PIO and explain what your beat is, or what particular topics interest you. Some PIOs create separate mailing lists based on topic. -The PIOS discussed the importance of diversity within their departments and how that allows them to communicate with different minority groups. The FDA translates its information into over 100 languages. The department of Education also translates every press release into Spanish.